b) the latitudinal (equator-to-pole) energy transfer (see section 1.2.5). EBMs are usually 0-D or 1-D in form. In 0-D EBMs, the Earth is considered as a single point in space, and in this case only the first process listed above is modelled. In 1-D models, the dimension included is latitude. Temperature for each latitude band is calculated using the appropriate latitudinal value for the various climatic parameters (e.g. albedo, energy flux etc.). Latitudinal energy transfer is usually estimated from a linear empirical relationship based on the difference between the latitudinal temperature and the global average temperature. 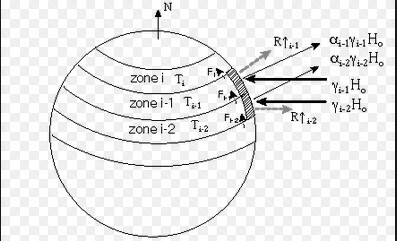 Other factors that may be included in the model equation are the time-dependent energy storage and the energy flux into the deep ocean.